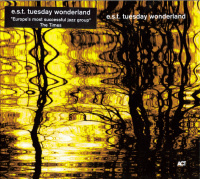 Managed to get hold of the Esbjorn Svensson Trio’s new release, Tuesday Wonderland, this morning. Jez Nelson had got Svensson in for a Jazz on 3 interview just over a weeks ago (22/9/06) in which he (that is, Jez) actually managed to lay into the band pretty well (that is, for a jazz interview), generally decrying the insipid monotony of their recent album releases and the total, unflinching lack of musical development, risk-taking, adventure and experimentation that had apparently come to define their very existance both on record and in live performance, to date. (“Jazz Groundhog Day” was the exact term used.) I can’t quite make out Jon3’s true opinion of the trio; Jez’s commentary seems to like to cream itself pretty well whenever it gets the chance to discuss the band (they’re on tour, again! ), although I do seem to remember him grumbling over Viaticum (and, yet, still playing plenty of tracks and dismissing his dismissal as mere uncertainty that would surely right itself, just as soon as he’d been able to listen to it hard enough…). My experience with the band amounts to E.S.T. Live ’95, Strange Place for Snow, and their live gig at the London Jazz Festival in 2004. To be fair, I’m not sure I can really make my mind up on this band, either. I think I’ve only listened to SPFS about three times, though I think I’ve only ever listened to about 70% of it (that is, every track, but only the first two-thirds of each one). Live ’95 is ok for throwing on when I need something to liven up the background, and a few of the tracks are pretty swinging, but nothing that jumps out. I’ve long felt that the real problem with the Esbjorn Svensson trio is Esbjorn Svensson, and the sooner he sacks himself, the better. In improvisations, he generally seems too quick to lose the plot, and most of the rest of the time – in the more formally arranged parts – he sounds as though he’s playing in much the same way that he’d be singing in the bath. Having said all that, Tuesday Wonderland is actually a pretty decent record! From somewhere, goodness knows where, he seems to have found something that’s been missing in most of what I’ve heard so far. I have no idea what exactly it is, but it’s something important. Probably classic EST sound. But a pretty interesting tune. Sounds like a classic sort of ballad that you can’t remember the name of? DiaS is really cool. For the first half, Svensson keeps it in the background, with Dan Berglund laying it out on top. In the second half, Svensson comes back out front again, playing some really swinging lines. The ending is slightly mad. This is another tune that seems to want to remind me of something else, but I can’t think what. This represents nicely what seems good about this disc, in that Svensson manages to keep it tight throughout, with no farting.